One person, one vote is a cherished principle, however, in most countries the representatives to the national legislative body come from certain fixed geographic regions. E.g., in the US Senators are elected from the states, while the members of the House of Representatives come from a congressional district. 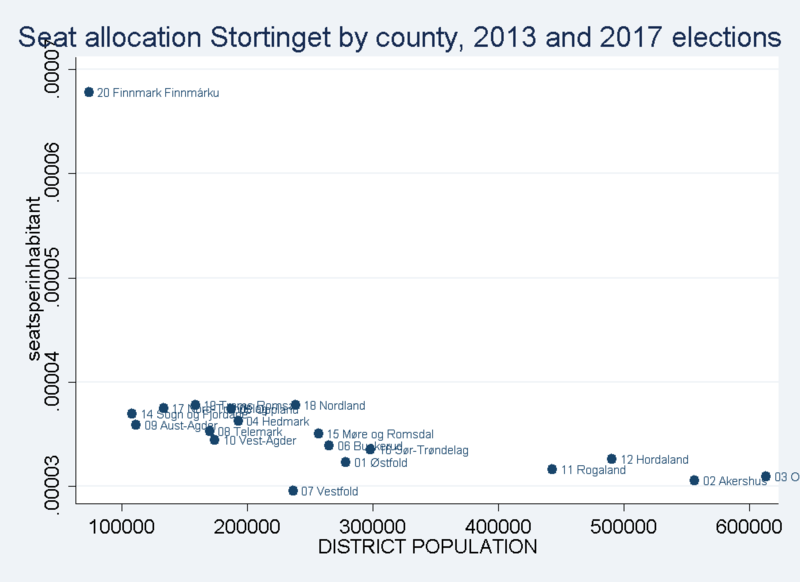 In Norway, each of the 169 representatives in parliament, the Storting, comes from one of 19 counties. At the heart of the distribution of seats is a weighted sum of the number of inhabitants of a county and its area, calculated as follows: #inhabitants+1.8 x area in sq.m. So 1 sq.m. counts as 1.8 person. This is a systematic overrepresentation of people in counties with relatively low population density and corresponding underrepresentation of people in more densely populated counties. This topic is currently on my research agenda, so I will return to it in not too long. A seminal paper (pdf) by Samuels and Snyder, more countries on Andrew Gelman’s blog, discussions of representation in the US Senate on CrookedTimber and in the New York Times. 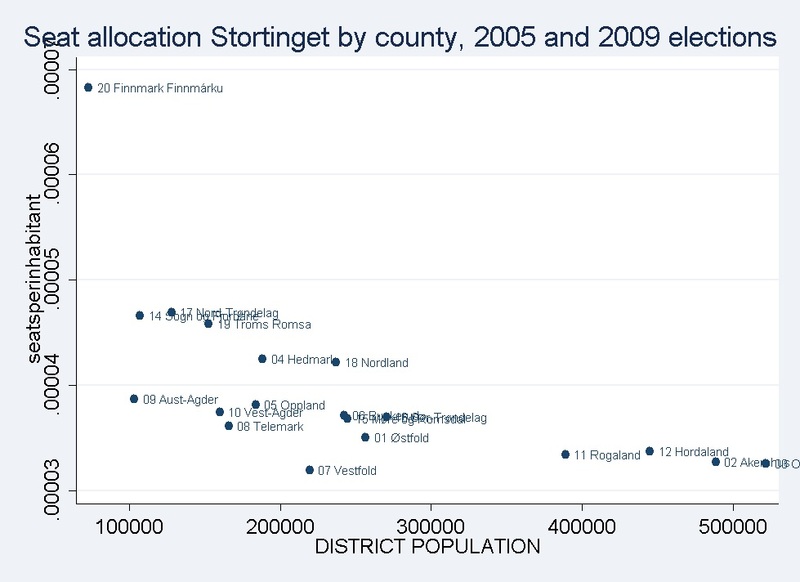 Update: for Norwegian readers: Discussions from the election in 2009, from Minerva, Aftenposten and Ferskvannsmandatet. This entry was posted in Elections, Research and tagged elections, representation, research on 2013-08-12 by Oeystein Hernaes.